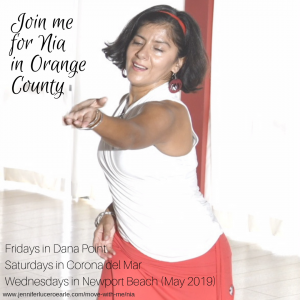 Nia is a wellness and fitness format that combines the expressiveness of dance, the power and explosiveness of martial arts, and the mindfulness of the healing arts. The foundation of Nia is “through movement we find health.” With over 52 movements that mobilize the base, core and upper extremities of your body, Nia is a holistic practice that creates a pathway for you to explore both your movement potential and capacity for wellness. As you learn to listen and respond to your body, you begin to feel increased joy and pleasure in movement, which inherently improves your well-being. Nia is practiced barefoot, non-impact, and adaptable to individual needs and abilities. I am a first degree black belt level trained Nia teacher, the highest level of training for a teacher. I am also trained in several other Nia specialty practices: Moving to Heal, Nia 5 Stages and 52 Moves. I discovered Nia in 2003 as part of my graduate training in the Experiential Health and Healing program at the Graduate Institute in Connecticut. The experience was truly transformational! After feeling paralyzed by grief, one Nia session opened the floodgates and allowed me to start moving and feeling alive again. I knew from that first day I wanted to share the magic of Nia with others. I’ve practiced a lot of different types of movement. Nia is unparalleled. While there is a form and structure, there is also plenty of freedom and individuality. The guiding sensation of Nia is pleasure. The guiding principle is the joy of movement. Together, they make it so that through movement we can achieve a state of wellness in mind, body, heart and spirit. My Nia classes focus on developing a student’s self-love and ability to feel joy in their bodies. As a facilitator, I strive to create a loving, mindful and open space for you to experience the joy of movement, self-expression and healing power of the Nia technique. My maiden name, Lucero, means “bright star.” I am excited to move, groove and share my light with you. 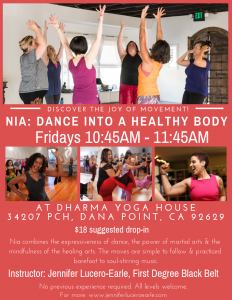 Nia is a wellness and fitness format that combines the expressiveness of dance, the power and explosiveness of martial arts, and the mindfulness of the healing arts. The foundation of Nia is “through movement we find health.” With over 52 movements that mobilize the base, core and upper extremities of your body, Nia is a holistic practice that creates a pathway for you to explore both your movement potential and capacity for wellness. As you learn to listen and respond to your body, you begin to feel increased joy and pleasure in movement, which inherently improves your well-being. Nia is practiced barefoot, non-impact, and adaptable to individual needs and abilities. My Nia classes focus on developing a student’s self-love and ability to feel joy in their bodies. These 9 movement forms are like archetypes, each one is multidimensional and has a personality or ideal. Together, we explore how we currently express them through our bodies and how to stretch ourselves to find new expression. 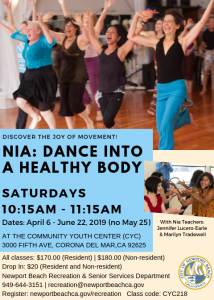 Dance into health with Nia! Improve your muscle tone, posture, flexibility, strength, balance, coordination, stress threshold, and capacity for joy. Nia combines the expressiveness of dance, the power of martial arts & the mindfulness of the healing arts. The moves are simple to follow & practiced barefoot to soul-stirring music. Drop-in’s can pay in person at the front deck at the Community Youth Center (CYC). The drop-in process is below. – Arrive about 10 minutes before class to check-in. – Go to the Community Youth Center (CYC) front desk. – The fee is $20 (resident and non-resident fee). – You can pay via cash, check or credit card. – If paying in cash, you must have the exact amount (they do not have change). – Then take your shoes off, go to the Corona del Mar room and let’s dance! **If after paying the drop-in fee you decide you want to do pay for the entire series, they will transfer your drop-in fee to pay for the series. Rise up. Awaken. Heed the call of your most holy and whole self. Sense your aliveness. 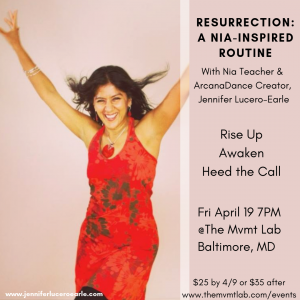 Inspired by the tarot card of Judgment and choreographed using the language of Nia, Resurrection sparks the life force energy in the body to awaken, rise and expand from the root to the crown. This body of work was choreographed by Jennifer Lucero-Earle, First Degree Black Belt and creator of ArcanaDance™, and fuses the language of Nia with the embodied archetypal storytelling of tarot. This journey into universal and personal consciousness is one of a kind. This class is a teaser for Saturday’s ArcanaDance™ workshop, The Dance of Awakening the Limitless Self: A Somatic Tarot Workshop with The Judgment Card. 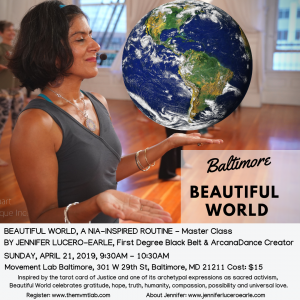 Join me for this master class in Baltimore. I created Beautiful World as a Nia-inspired routine and expression of my hopes and dreams for embodying presence on this sacred planet we call home. Inspired by the tarot card of Justice and one of its archetypal expressions as sacred activism, Beautiful World celebrates gratitude, hope, truth, humanity, compassion, possibility and universal love. The physical focus is Beautiful World is sensory awareness of the core of the body. In Nia, the core of the body is comprised of the pelvis, chest and head. All of our major organs and our chakra system are located in the center of the body – each one protected by the regions defined as the pelvis, chest and head. The intent of this routine is to experience deeper embodiment and presence with ourselves, one another and the world we live in – from our center. 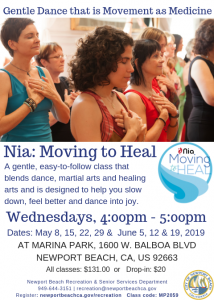 Moving to Heal is a gentle Nia class. Nia is a fusion of dance, martial arts and healing arts such as yoga. Moving to Heal is adaptable for anyone returning to movement, recovering from injury or illness, or simply needing a slower pace. This beautiful class format is designed for people seeking ways to feel better and more joyful in their bodies. Enjoy easy-to-follow choreography to fun music in a supportive atmosphere of safety and trust. Register now. Drop-in’s welcome! Drop-in to any class $20 *Pay the front desk. Bring water and a yoga mat or towel for the end of class. We dance barefoot but if necessary, you are welcome to wear soft flexible shoes or sneakers. Chairs will be provided for those who need to or would like to dance in a chair. Parking for Marina Park classes is free if you use the Parkmobile app. Please go to http://www.newportbeachca.gov/government/departments/recreation-senior-services/marina-park/parking for more information about parking procedures. 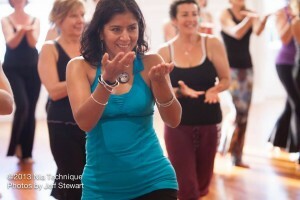 Nia: MOVE IT – Learn the 52 Moves of Nia – Registration is open! 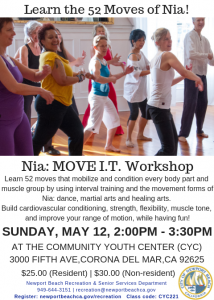 Join me on Sunday, May 12 (yes, Mother’s Day) for a special 90-minute workshop where you will learn all of Nia’s 52 moves. This workshop will allow you to not only deepen your Nia practice but will help you feel feel even more confident in class. Enjoy this short and sweet little promo video created by NiaSeattle first degree Black Belt teacher Jason Alan Griffin as part of the NiaSeattle Visibility Project. Check the NiaSeattle Facebook page for more videos of Nia teachers in Seattle! Wear loose comfortable clothes that you can easily move and sweat in. Nia is traditionally practiced barefoot. If, for health reasons, you must wear shoes, please ensure that they are “indoor” shoes only. You may want to bring a towel. Listen to your body. In Nia, we follow the pleasure principle: if it feels good, keep doing it. If it doesn’t feel good, tweak it until you find what feels good for you. Do less. Don’t worry about breaking a sweat at first. Instead, connect to your feet. Allow your feet time to develop strength so that you stay comfortable. Increase intensity gradually. Give yourself time to “learn” the moves. Once your legs are dynamically involved, begin to add more movement of the core and arms. Increase complexity gradually. Express yourself. Use your voice and breath to stimulate your core. Be yourself and move in your own unique and beautiful way. Let go of fear and dance. Play. Instead of spending energy on expecting, analyzing, or critiquing, let your inner child come out and open yourself up to having an amazing experience. Copyright © 2019 Jennifer Lucero-Earle. Powered by WordPress. Theme: Spacious by ThemeGrill.